James P. Syvertsen has spent his academic life studying the tangy fruits that have become a part of Florida culture. His research, which focuses on citrus trees’ responses to environmental stresses, has earned him international recognition and a position as president of the Florida State Horticulture Society. Syvertsen has studied everything in the environment that can harm citrus trees in the hope of helping citrus growers around the world produce healthy trees and maintain the best fruit possible. 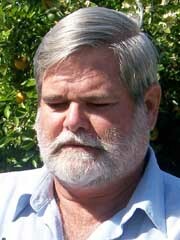 His research has “allowed for the development of alternative hypotheses for sustainable and economical production of commercial citrus in Florida in the presence of the serious diseases, citrus greening and citrus canker,” according to a letter co-authored by Harold W. Browning, the director of UF’s Citrus and Research Education Center, and Daniel J. Cantliffe, chair of the horticultural sciences department. Syvertsen’s work starts in the dirt. and finishes in the air via the citrus tree. In a series of lab, greenhouse and field experiments, he has studied how citrus trees react to soil variations, including water, salinity and nutrient content. Much of his work focuses on tree water use and on leaf gas exchange with air. In a related project, Syvertsen has collaborated with a team of scientists to study the effects of the root-feeding weevil, a centimeter-long insect whose numerous larvae munch on the root system of citrus trees. Syvertsen has been invited to share his knowledge of citrus growth in Mexico, Uruguay, Spain, Italy and Australia.